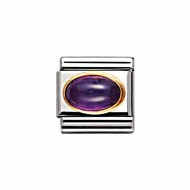 Composable Nomination Classic Gold and Natural Semi Precious Oval Stones Amethyst Charm, a stainless steel base link with 18ct Gold and natural semi precious oval stones. 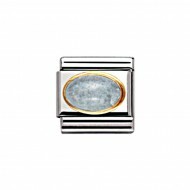 Composable Nomination Classic Gold and Natural Semi Precious Oval Stones Aquamarine Charm, a stainless steel base link with 18ct Gold and natural semi precious oval stones. 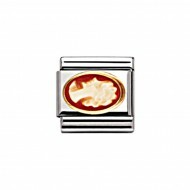 Composable Nomination Classic Gold and Natural Semi Precious Oval Stones Cameo Charm, a stainless steel base link with 18ct Gold and natural semi precious oval stones. 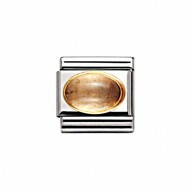 Composable Nomination Classic Gold and Natural Semi Precious Oval Stones Citrine Charm, a stainless steel base link with 18ct Gold and natural semi precious oval stones. Composable Nomination Classic Gold and Natural Semi Precious Oval Stones Emerald Charm, a stainless steel base link with 18ct Gold and natural semi precious oval stones. Composable Nomination Classic Gold and Natural Semi Precious Oval Stones Garnet Charm, a stainless steel base link with 18ct Gold and natural semi precious oval stones. Composable Nomination Classic Gold and Natural Semi Precious Oval Stones Iolite Charm, a stainless steel base link with 18ct Gold and natural semi precious oval stones. 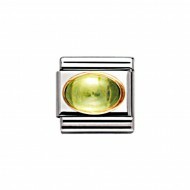 Composable Nomination Classic Gold and Natural Semi Precious Oval Stones Peridot Charm, a stainless steel base link with 18ct Gold and natural semi precious oval stones. Composable Nomination Classic Gold and Natural Semi Precious Oval Stones Ruby Charm, a stainless steel base link with 18ct Gold and natural semi precious oval stones. 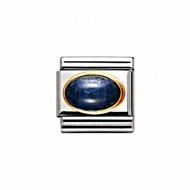 Composable Nomination Classic Gold and Natural Semi Precious Oval Stones Sapphire Charm, a stainless steel base link with 18ct Gold and natural semi precious oval stones.